This is a very easy soup to prepare. Split peas come in green and yellow varieties. Once dried, their indigestible skins are removed and the peas are split in half. They cook in under 45 minutes. Mix and match your peas! 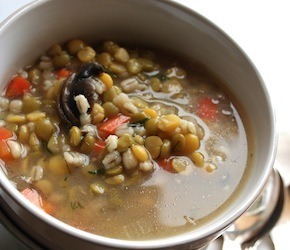 Add split peas, barley, water and bay leaves to a large soup pot. Bring to a boil, reduce heat and simmer, partially covered for 45 minutes. Stir often. In a medium size skillet, heat oil for 30 seconds. Add garlic. Saute for 1 minute. Add onions. Cook for 5 minutes or until onion softened. Add soy sauce, mushrooms, carrot and dill. Sauté for 5 minutes. Add cooked vegetables to split pea mixture along with salt. Simmer for 20 minutes, stirring often. Add pepper last 5 minutes of cooking.